Allstate Appliances offers "Foodie Fridays" event to help consumers considering new appliances, but not quite sure which appliances would fit their needs best, or for the consumer who would like information on new and different products available. Allstate Appliances, one of the largest, family-owned household appliance businesses in the Phoenix metro area, announces the continuing of their "Foodie Friday" demonstration events. 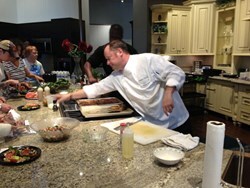 "Foodie Friday" is held at the Allstate Appliances Scottsdale Showroom located at 15250 N. Hayden Rd. from 11:30 am – 1:00 pm MST. For cooking enthusiasts looking to learn new skills on appliances they already own or for a new consumer looking for the perfect appliances for their kitchen, "Foodie Friday" is the place for a demonstration of what the right appliances can do for you. "Foodie Friday" events feature manufacturer chefs and representatives who demonstrate on the appliances in one of Allstate Appliances’ live kitchens. Lunch is cooked on the appliances and served to customers. Cost for the event is free. Visit http://www.allstateappliances.com/demonstrations for more information, or to RSVP to an event. Allstate Appliances offers a beautiful showroom and a knowledgeable sales staff to guide you in selecting the right kitchen, laundry, and outdoor appliances to fit your needs. They carry high-quality brands including SubZero/Wolf, Viking, Miele, Dacor, Thermador, Electrolux, Frigidaire, LG, and Bosch, among others. The newest line of appliances carried includes Bertazzoni (now a live kitchen display in the Scottsdale Showroom), American Range (live kitchen display coming early January 2014), and Woodstone Pizza Oven (live indoor/outdoor kitchen display in progress). A complete stainless steel kitchen package is being offered now as a Holiday Sale, which includes a side-by-side refrigerator with ice and water dispenser, an electric range with a self-cleaning oven and a smooth surface cooktop, a dishwasher, and an over-the-range microwave oven for $1,795. Contact a sales associate at Allstate Appliances for more details today! Allstate Appliances is a local, family-owned and operated business, which began in 1970. Focusing only on large household appliances, Allstate supplies the Phoenix metro area. From sales and ordering through delivery and installation, personnel have an average of 20 years in the business. Allstate’s mission is to use knowledge and expertise to provide a great experience for customers, from the do-it-yourself homeowner to the largest builder. For more information, visit http://www.allstateappliances.com.